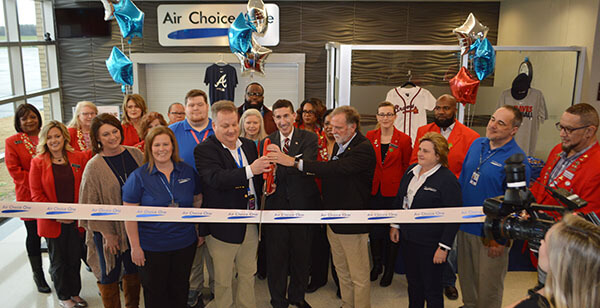 From Left, Jackson Madison County Airport Authority's Cindy Melton, Air Choice One's Tay McDaniel and CEO Shane Storz, Congressman David Kustoff and Madison County Mayor Jimmy Harris cut the ribbon on flights to Atlanta, Georgia. The first flight from Jackson, Tennessee to Atlanta, Georgia with Air Choice One left McKellar-Sipes Regional Airport today at full capacity. The eight passenger Cessna Caravan took off around noon, arriving back in Jackson the same day. In celebration of the event, a ribbon cutting was held and open to the public with a chance at round trip tickets to Atlanta with refreshments provided. "It is an exciting day for Air Choice One and the Jackson area," says Air Choice One CEO Shane Storz. "We feel very privileged to be the air carrier for Jackson to Atlanta, which will open connections for this community to the world." After listening to feedback from customers, community, city leaders, the airport commission and more, Atlanta was the next chosen destination for flights from Jackson. Storz says it is a great starting point to connect travelers to the Southeast and international flights. Tickets are on sale with special fares starting at $45.00 before taxes and fees. Six flights will be provided weekly from Jackson to Atlanta with round-trip flights taking place Sunday through Friday. To reserve your flight, visit AirChoiceOne.com or phone 866-I FLY VIP. Air Choice One will continue its service to St. Louis with 12 flights per week. Air Choice One has provided air service to the Jackson community since 2015 and is set to serve Jackson for the next four years.